A screen that goes dark…? Your PC or laptop might have a virus. Just like humans, computers can get “sick”, but not with harmful bacteria. Computer viruses are malicious programs called malware that are designed to destroy or steal your data. Malware can silently replicate once in your computer system, like viruses that infect humans. You won’t know that the malware and viruses are there until your machine starts to show symptoms. Computer viruses have been around since at least the 1980s, but the numbers of circulating viruses have skyrocketed in recent years. Antivirus software packages constantly are updated to help prevent infections, but some “tech” germs still can get through to your machine. If you see or experience any of the virus-carrying situations listed and described below, please give Computer Central a call at (508) 829-0000 ASAP for help. New viruses are released every day. Call Computer Central at 508-829-0000 if your computer gets “sick”. We’re the PC Doctors who make house calls! This virus looks like a pop up ad, but it’s not a good offer. If you see a picture of a person wearing a headphone in the corner of your browser window (pictured above), you have the 24×7 Support or PC Tech Hotline virus. This virus infiltrates your system and appears at the top of every internet window you open, with a warning about problems and a promise to help you – for a price. Don’t pay the fee! It’s a scam. If you see this type of image in your browser window, give Computer Central a call at 508-829-0000 to arrange for a computer clean up. 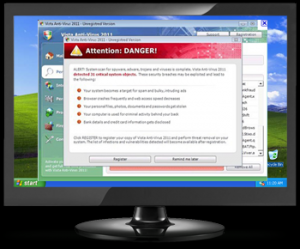 Another common malware program is the Fake Anti-Virus Software. A window like the one pictured below might unexpectedly pop up on your desktop with an urgent warning that a scan found multiple viruses, registry errors, and other problems on your computer. It also will say that the problems can be solved only with a costly upgrade to the “full version” of the software for sale. Don’t buy or download that software! Immediately shut down your computer to avoid further infection, and call Computer Central at 508-829-0000. Beware of unsolicited calls from people outside the U.S. who claim to be affiliated with Microsoft, Norton, or other legitimate companies, and who say that they have detected virus activity on your computer. These callers will urge you to let them connect to your computer remotely to remove the viruses, for a fee. If you receive a call like this, immediately hang up the phone. It’s a scam from data thieves who want to insert a software that will allow them remote access to your computer whenever they choose. If you have paid one of these callers a fee and allowed them to access your computer, call your bank first to have the charges reversed. Next, call Computer Central at 508-829-0000. We’ll remove any malicious software infecting your system. Have friends and family received email blasts of strange messages from your email address, messages which you did not send out? Someone hacked into your email account and sent email messages containing malware to your contact list. If this happens to you, change your email password immediately. Then call Computer Central at 508-829-0000. We will remove any password-stealing software that hackers have embedded in your computer. Did you open your browser only to find a new internet homepage that you did not choose? Some malware programs create fake homepages that look just like legitimate search engines such as Google, but which link users to virus-infected websites and ads. When users try to switch back to their original homepage, these malware programs block the change. Should this happen to you, please call Computer Central at 508-829-0000, and we’ll remove the root malware program causing the problem. Ransomware is a kidnapper virus that hijacks your computer and locks it down. This malware won’t unlock your machine until you pay. The virus pops up in the form of a fake government agency website as you surf the internet. The example pictured above looks like an FBI site, but it’s a fake. There also are fraudulent CIA, NSA, Department of Justice, and other fake government agency pages circulating on internet. When the ransomware virus gains access to your computer it’s hard to clear it off. You may need to remove your computer hard drive and scan it outside your machine in order to delete this powerful malware. Call Computer Central at 508-829-0000 should ransomware lock you up. We’ll unlock your system and get you working again. These messages often look like MS Windows error messages you might have seen, with blue screens and white text, or antivirus messages from legitimate companies such as Norton, Microsoft Security Essentials, Charter, and Verizon. Some “Support Number” Pop Up messages even include audio feed with urgent instructions to call an onscreen phone number. Don’t call that onscreen number! These “Support Number” Pop Ups are fake messages from hackers who want remote access to your computer. They are not from Norton, Microsoft, or any other company with whom you may do business. Shut down and restart your computer to try to clear the messages. If you still see the “Support Number” Pop Up when you log in again, call Computer Central at 508-829-0000. We’re here to help you. Do you see more and more toolbars – and a smaller and smaller homepage – every time you connect to the internet? Malicious software programs often use toolbars to take over your internet browser and lead you to sites that download viruses into your computer. You can disable the toolbars, but the malware programs that put them there still are on your machine. Call Computer Central at 508-829-0000 if this happens to you. We’re the PC Doctors who make house calls!